Attic ladder safety is paramount in the workplace but also at home as well. We use safety procedures in the workplace to provide a safe environment. We should use the procedures at home to ensure we safely use certain equipment such as attic ladders. Attic Lad WA provide a ladder that you can confidently use knowing you will be safe if you follow the right procedure. Attic Lad WA will always provide safety tips to follow when using the attic ladder. To safely use the attic ladder do not overload the weight rating. Attic Lad WA’s attic ladders are rated for deluxe wood 150kg, deluxe aluminum attic ladder is rated for 160kg. Overreaching while standing on an attic ladder can be unsafe. If you are using the wrong procedure when putting boxes into the attic you can cause yourself to be unstable or cause harm. To correctly use the attic ladder ensure you are taking each step to climb into the attic before placing down boxes. There are correct ways to safely install an attic ladder. Attic Lad WA can provide the best service to ensure the correct installation of an attic ladder, which can be used in a safe manner. These steps are provided by Attic Lad WA to ensure a safe environment in your home when using your attic ladder. 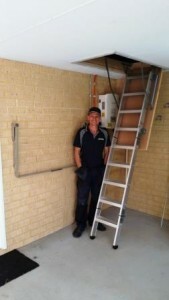 Attic lad WA prides himself on offering safe affordably attic ladders across Perth. If you would like a no obligation free quote please feel free to contact me.